ReplyButler supports the PlentyMarkets system. Enter your data at "Configuration > Options > CRM". Use the button "test" zu verify the data. In oder to access the data, you need to create a user account in plentyMarkets under "Settings > Accounts > API". For each e-mail the matching customer data is queried from your server and shown in the ReplyButler Sidebar. 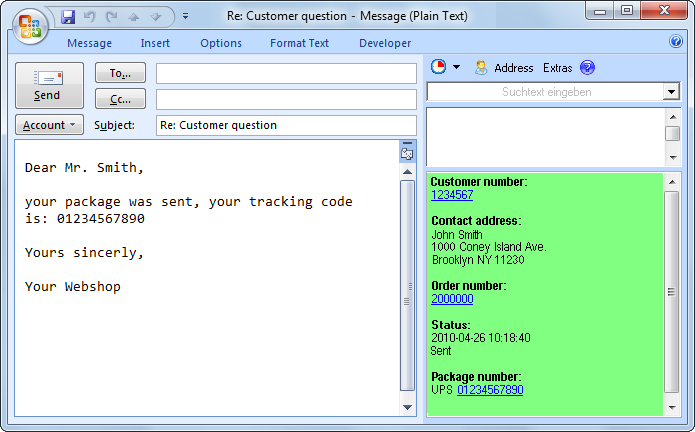 ReplyButler uses the sender's e-mail address to query the data from your plentyMarkets database. Please note that plentyMarkets only returns the orders of the last 6 weeks. If no data was found for the e-mail address, ReplyButler checks if the e-mail contains an Amazon order number. If such a number is found, ReplyButler displays the data from this order and this customer in the sidebar. Furthermore you may enter an e-mail address, customer number, order number or Amazon order id into the sidebar search field to query the respective data. You can use the RB-Tokens to insert data from your order system into the cliptexts. Use the hotkeys Ctrl+Shift+1 or Ctrl+Shift+2 to go from an e-mail (opened or not opened) to the respective customer or order page in your website.